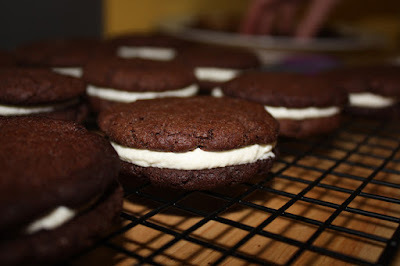 Chocolate creme sandwich cookies, or homemade Oreos. Baking Day is an annual tradition started about four years ago by Boyfriend's mother, who lives in San Francisco. It's more or less a cookie swap or cookie exchange, only everyone who is participating actually bakes together, too. It's a full day and usually involves as much time in the kitchen beating butter and greasing trays, as at the dining room table listening to everyone reminisce about their childhood memories—what their grandmothers baked, the recipes their mothers handed down, their family traditions. While I lived in Boyfriend's hometown, I so looked forward to Baking Day because it made me feel like winter and the holidays were really happening, which was sometimes hard for me, an east-coast native, putting up with the mild San Francisco climate. It just never felt like winter when it was 55 and drizzling... persistently. When I moved away about two years ago, I decided to carry on Baking Day with an East Coast edition. This year it was a small, late-night affair on a weekday, but the important parts still happened, and once again, it feels like winter. My mom's magic cookie bars, a.k.a. five-layer bars, a.k.a. "crack cookies." My mom made her magic cookie bars, or seven-layer bars, which were dubbed "crack cookies" last year by one of my friends who developed a little addiction to them. 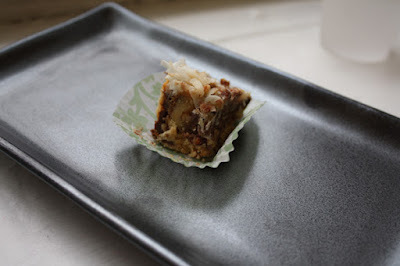 They are graham cracker crumbs pressed with melted butter, topped with walnuts, chocolate chips, shredded coconut, and sweetened condensed milk. Peanut butter jammers with raspberry jam. 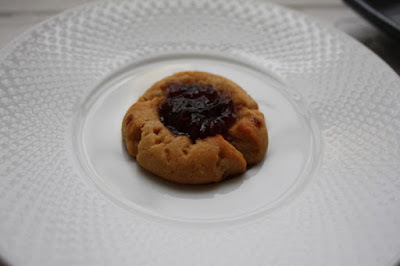 I made two cookies this year: peanut butter jammers (above), which is a peanut butter and raspberry jelly thumbprint cookie, and oatmeal chocolate chip cookies, which are my specialty. 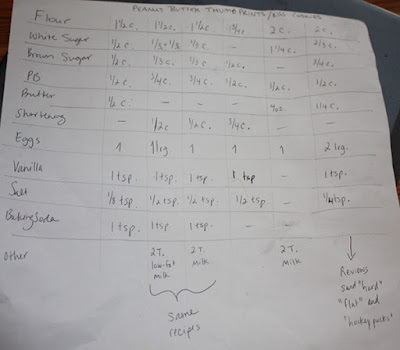 to make the peanut butter cookie base, I deduced a recipe by comparing the ingredient lists of five similar recipes (see below; although there are six columns, two are identical). I was shooting for a cookie that would be more round than flat, but failed on that front. However, I succeeded in baking a cookie with strong peanut butter flavor. Deductive notes on peanut butter cookie recipes. 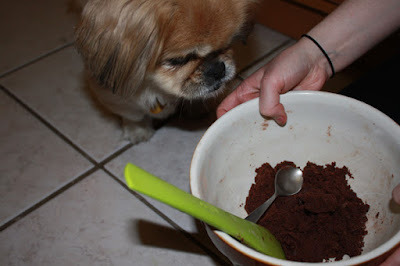 As the homemade "Oreos" come together, Midge the dog hesitantly decides she does not want to eat the dough. Only one of my sister could make it this year, but she pulled together these glorious chocolate creme cookies. She wanted them to turn out crisp and slightly dry, just like an Oreo—and they did! She used a recipe from Smitten Kitchen. 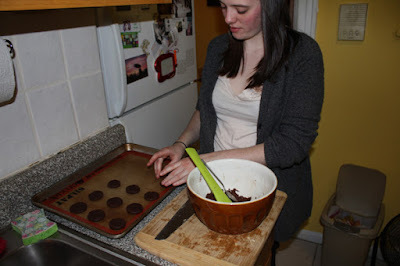 My sister shapes the chocolate cookie dough into slightly flattened rounds. The chocolate cookies bake for 9 minutes and then must cool fully. 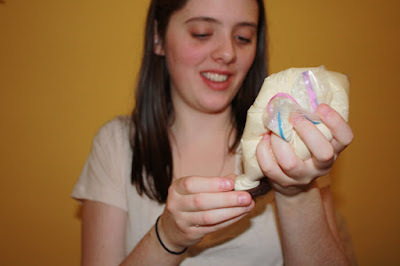 Afterward, vanilla creme is piped on one, and another cookie is sandwiched on top. 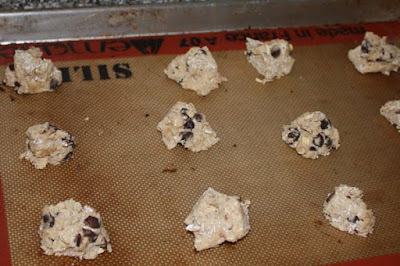 My oatmeal chocolate chip cookie dough waits for a space in the oven. My oatmeal (something) cookies get the chocolate chip treatment this year. The day after Baking Day, a few co-workers and I took were going to take part in a cookie exchange at work; so I actually made good use of Baking Day and pulled together four dozen extra oatmeal chocolate chip cookies to bring to the office. 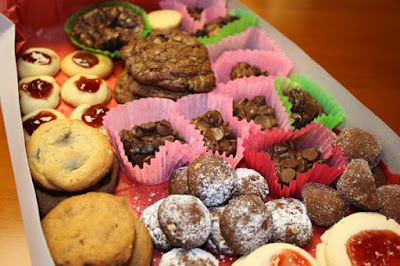 An office cookie swap instantly doubled my net gains of Baking Day. This is the colorful assortment I brought home.